Stock # 5HEF33375, Intercooled Turbo Diesel V-8 6.7 L/406, Automatic, 1739 mi. Rule the roads in this shadow black 2017 Ford Super Duty F-450 Platinum Fx4 Crew Cab Dually pickup at a great deal today! 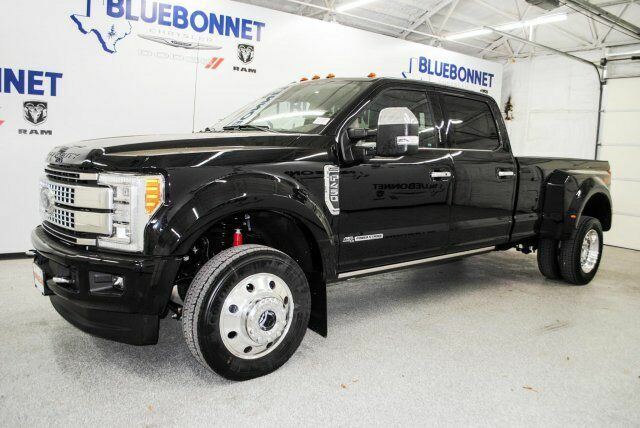 This luxurious truck features beautiful brown leather interior, a bed liner, running boards, sun roof, hitch, tow hooks, a push start, touch screen display, MP3, SYNC, Navigation, a backup camera, heated/cooled power seats, and so much more. This vehicle's powerful 6.7L V8 Turbo Diesel engine is in perfect working condition for excellent towing capacity! The tires have at least 3/4 of their life span left, & the mileage represented is 100% accurate. With a smooth shifting automatic transmission & all power equipment working properly, each ride will be one of adventure & pleasure! If you have any questions about this amazing find or any of our other vehicles, please call our sales office. Thank you for your interest & we look forward to hearing from you.